The recent diplomatic spat between Canada and Saudi Arabia has made the news cycle around the world but one aspect of the dispute has received very little coverage. 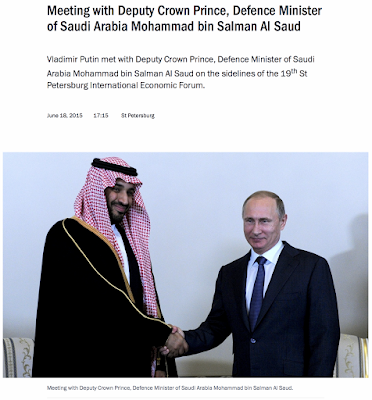 Given that Saudi Arabia is actually growing closer, particularly since the October 2017 summit between the two nations, and given the fact that Russia has banned Canada’s Minister of Foreign Affairs, Chrystia Freeland, it shouldn’t come as a surprise that Russia has offered its considered opinion on the recent fray. “SAMI (the state-owned Saudi Arabian Military Industries) said the MoU with Russian state-owned arms exporter Rosoboronexport came in the context of contracts signed to procure the S-400, the Kornet-EM system, the TOS-1A, the AGS-30 and the Kalashnikov AK-103. It did not specify the number of each system or the value of the procurement deal. 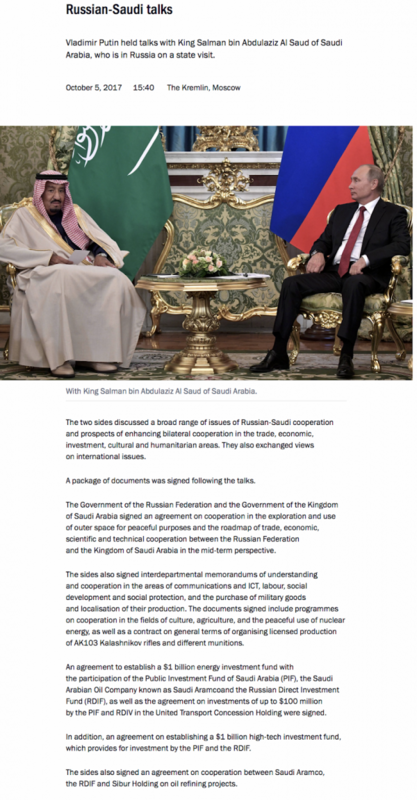 The two leaders (Putin and King Salman) had a “friendly and substantial discussion based on a desire by Moscow and Riyadh to consistently grow mutually-beneficial partnerships in all spheres,” Lavrov said at a briefing alongside his Saudi counterpart Adel al-Jubeir. 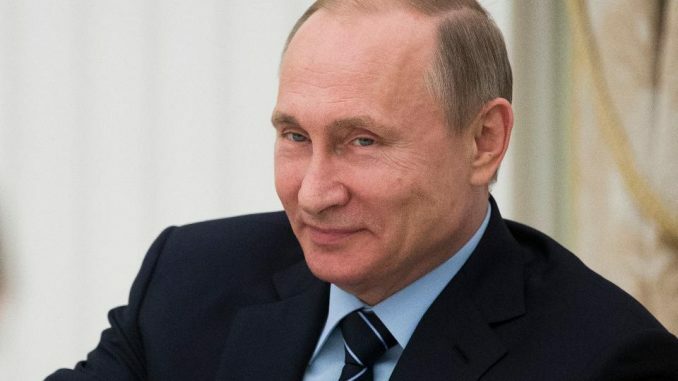 “President of Russia Vladimir Putin: Your Highness, colleagues, good afternoon. It is a pleasure to meet with you here in Russia, in St Petersburg. We have enjoyed friendly relations with the Kingdom for a number of years and we highly value these relations. I would like to note with satisfaction that our trade is growing. Although it is still rather modest in absolute figures, the trend is very good. 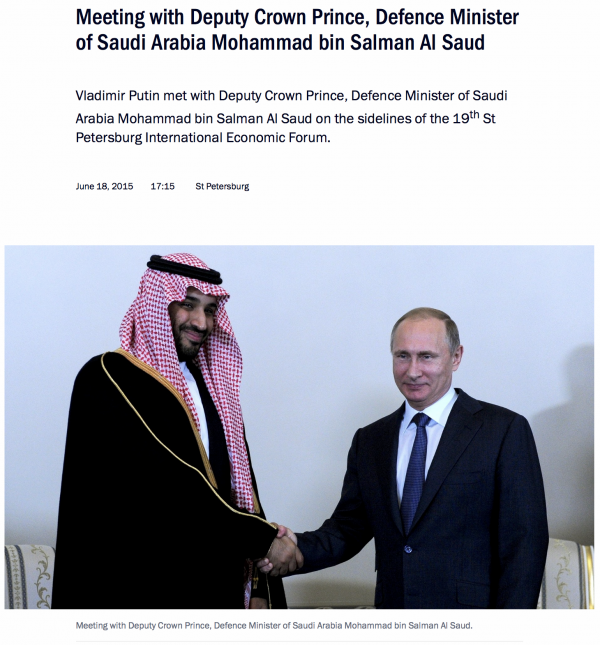 As you may know, during my telephone conversation with the King of Saudi Arabia I invited him to visit the Russian Federation. I would like to confirm this invitation and convey my best wishes to His Majesty. Deputy Crown Prince, Defence Minister of Saudi Arabia Muhammad bin Salman Al Saud (retranslated): I am very happy to have this opportunity to meet with you for the second time. I have the honour of conveying to you the greetings and best wishes from the Custodian of the Two Holy Mosques and expressing his great respect for your Excellency. I would like to say that the Custodian of the Two Mosques confirms his acceptance of your invitation. I also have the honour of inviting you to visit the Kingdom of Saudi Arabia. We view Russia as an important state in the modern world. Our relations have a long history. Russia was the first foreign state to recognise Saudi Arabia in 1926. Therefore, we will work to develop bilateral relations in all areas. 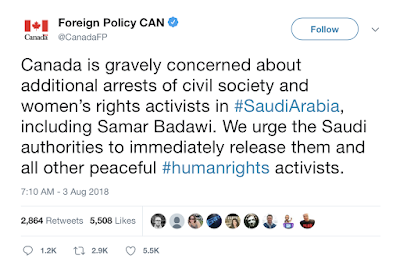 “Question: Relations between Canada and Saudi Arabia have recently soured after Canada’s Foreign Ministry criticised human rights violations and called for the immediate release of political activists in Saudi Arabia. Riyadh has announced its decision to call its ambassador in Ottawa back for consultations, expel the Canadian Ambassador and suspend flights to Canada by the Saudi Arabia state airline. Will you comment on this, please? Maria Zakharova: We consistently and firmly advocate compliance with universal human rights with due regard for the specific national customs and traditions that developed in a given country over a long period of time. We have always said that the politicisation of human rights matters is unacceptable. 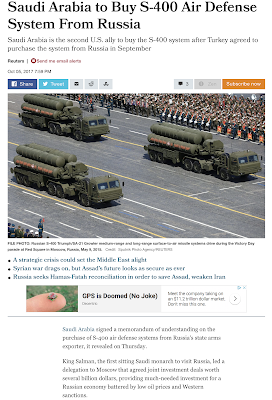 I find these comments from the Russians quite interesting, particularly when put into the context of the growing diplomatic, economic and military closeness between the Saudis and the Russians. 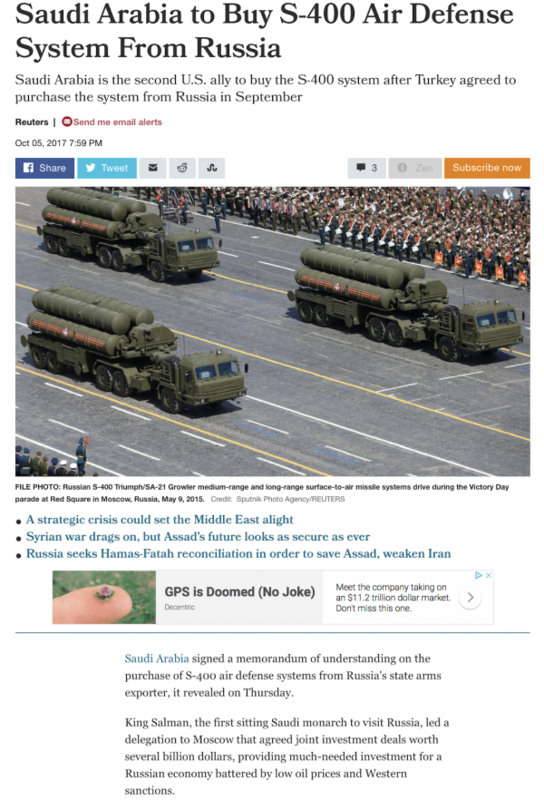 As well, given that the Saudis are the biggest purchasers of weapons in the world, it’s not terribly surprising that Canada’s traditional ally, the United States, a world leader in the manufacturing of weapons and major seller of materiel to the Saudi royal family, has remained quite subdued when it comes to supporting the Canadian side of the contentious Saudi human rights issue. Seth Green And Clare Grant: Beauty And The Beast? Marc Jacobs It’s Not Easy To Out dress Beyonce!